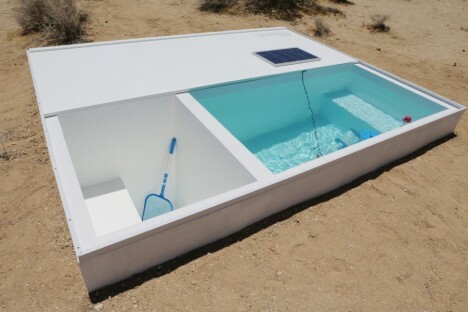 An art installation with a side of rugged adventure, the Social Pool is a project open to the public but locked and with a location only revealed via coordinates that lead visitors on a long trek to its discovery. 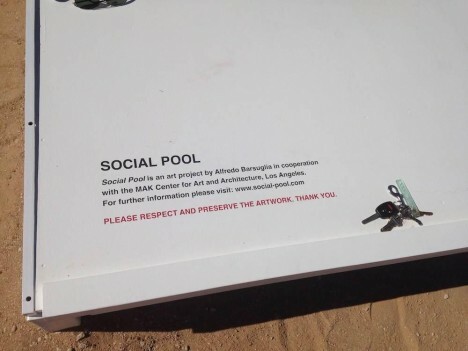 Seekers must first travel to the MAK Center for Art and Architecture in West Hollywood and retrieve one of four keys that open the pool, and will be tasked with taking one gallon water to help refill it as well. Los Angeles area travelers do not stumble upon it by accident – it is not on any road, trail or path. 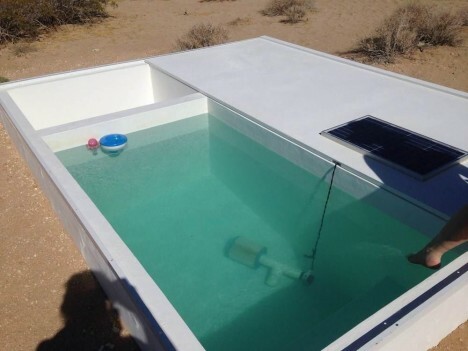 Keys are to be returned within 24 hours, whether or not you find the secret spot and uncover the cool pool of filtered water, powered by solar panels. You cannot reserve a key in advance – you must show up and see if one is available. Uncertainty is part of the experience, like it or not. 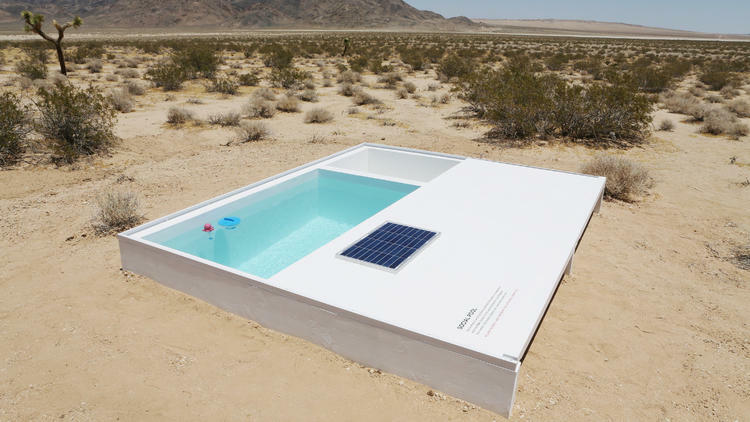 Designed by Austrian artist Alfredo Barsugli, LAist describes it as something “meant to reflect on the lengths humans would go to in the pursuit of luxury,” but also as a good excuse to spend some time exploring an amazing desert landscape. 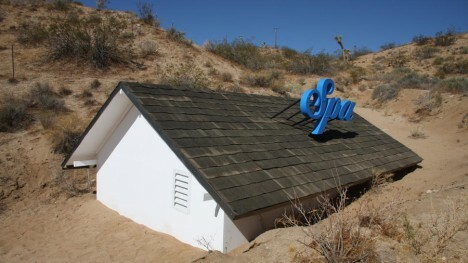 Barsugli is not new to strange desert installations – a previous piece, the Oderfla Beauty Resort, featured a spa building semi-submerged in desert sand. It is also worth stocking up on gas, food and water and watching out for snakes, lizards and hares along the way. Hint: the pool is not close to the MAK. 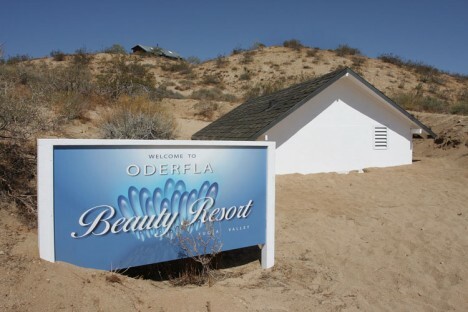 Its position is only given broadly to the public: somewhere in the southern Mojave Desert between Joshua Tree and Apple Valley. 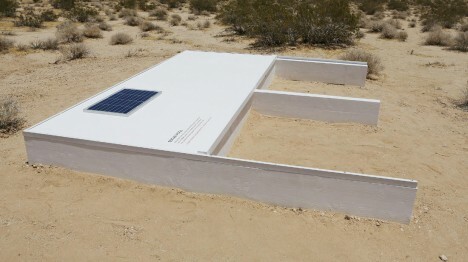 Images by Alfredo Barsugli and Juliet Bennett Rylah of LAist.